Seated (from left): Dr. Mindy Aisen, chief medical officer at Rancho Los Amigos and patient Erik Sorto. 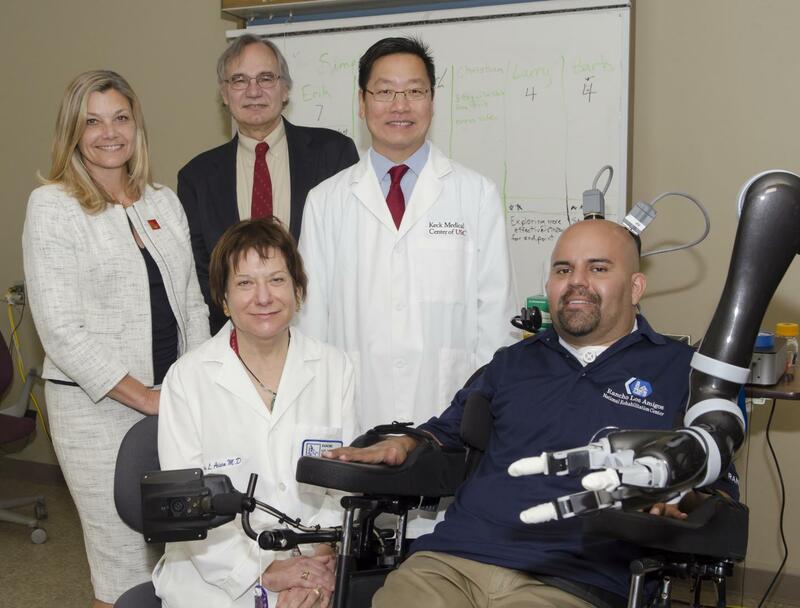 Standing: Dr. Christianne Heck, associate professor of neurology at USC and codirector of the USC Neurorestoration Center; Dr. Richard Andersen, the James G. Boswell Professor of Neuroscience at Caltech; Dr. Charles Y. Liu, professor of neurological surgery, neurology, and biomedical engineering at USC. Paralyzed from the neck down after suffering a gunshot wound when he was 21, Erik G. Sorto now can move a robotic arm just by thinking about it and using his imagination. Through a clinical collaboration between Caltech, Keck Medicine of USC and Rancho Los Amigos National Rehabilitation Center, the now 34-year-old Sorto is the first person in the world to have a neural prosthetic device implanted in a region of the brain where intentions are made, giving him the ability to perform a fluid hand-shaking gesture, drink a beverage, and even play “rock, paper, scissors,” using a robotic arm. Neural prosthetic devices implanted in the brain’s movement center, the motor cortex, can allow patients with paralysis to control the movement of a robotic limb. However, current neuroprosthetics produce motion that is delayed and jerky–not the smooth and seemingly automatic gestures associated with natural movement. Now, by implanting neuroprosthetics in a part of the brain that controls not the movement directly but rather our intent to move, Caltech researchers have developed a way to produce more natural and fluid motions. Designed to test the safety and effectiveness of this new approach, the clinical trial was led by principal investigator Richard Andersen, the James G. Boswell Professor of Neuroscience at Caltech, neurosurgeon Charles Y. Liu, professor of neurological surgery, neurology, and biomedical engineering at USC, and neurologist Mindy Aisen, chief medical officer at Rancho Los Amigos. Andersen and his colleagues wanted to improve the versatility of movement that a neuroprosthetic can offer to patients by recording signals from a different brain region other than the motor cortex, i.e., the posterior parietal cortex (PPC), a high-level cognitive area. In earlier animal studies, the Andersen lab found that it is here, in the PPC, that the initial intent to make a movement is formed. These intentions are then transmitted to the motor cortex, through the spinal cord, and on to the arms and legs where the movement is executed. The device was surgically implanted in Sorto’s brain at Keck Hospital of USC in April 2013, and he since has been training with Caltech researchers and staff at Rancho Los Amigos to control a computer cursor and a robotic arm with his mind. The researchers saw just what they were hoping for: intuitive movement of the robotic arm. March 29, 2019 - Neuroprosthetics Market will Procure USD 10.48 Billion at 12.4% by 2023 | Cochlear, Abbott, Neuropace, Medtronic, Boston Scientific Etc. | MedgadgetNeuroprosthetics are medical devices that are developed in such a way that provide signal to the central nervous system and receive indications from the. April 17, 2019 - Global Neuroprosthetics Market Insights 2019-2024: Nevro, St. Jude Medical, Sonova and Atrotech Education MarketGlobal Neuroprosthetics Market report presents the up to date and useful market insights stating the product definition, product type, and variety of applications. Neuroprosthetics Market will Procure USD 10.48 Billion at 12.4% by 2023 | Cochlear, Abbott, Neuropace, Medtronic, Boston Scientific Etc.